Six figure hybrids make sense like trying to lose weight by having a glass of water with your biggie order of onion rings and triple patty cheeseburger. Maybe it helps a little. But then, the thing to understand is that it’s not about making sense. About having to build a certain number of “zero emissions” vehicles, because the government says so. In order to be allowed to sell normal cars at all. And – in Europe – to be allowed to drive at all. Electric cars qualify, but they take forever to recharge and can’t go very far and – other than the Tesla – they’re under-powered/underperforming Ugly Bettys. Enter the high-end, plug-in hybrid. 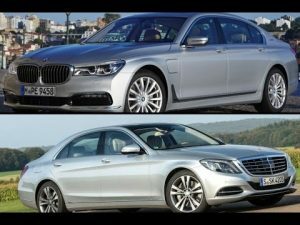 The BMW 7 and its chief rivals, the Mercedes Benz S-Class hybrid and the Audi A8 hybrid. They make it permissible for BMW, Benz and Audi to sell non-hybrid versions of these cars – and they don’t diminish the experience of owning one of these cars. 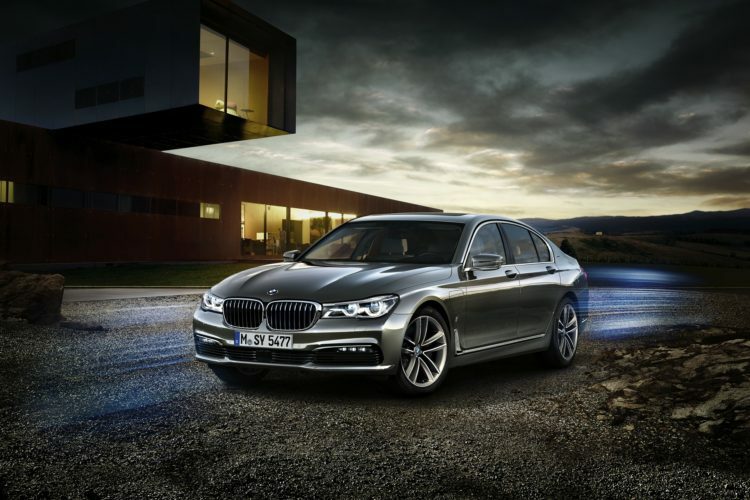 The 740e is the new, plug-in hybrid version of BMW’s top-of-the-line 7 Series ultra-luxury sedan. 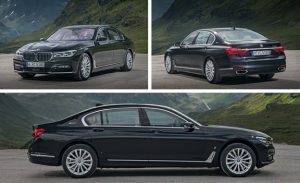 It’s the first 7 Series to have fewer than six cylinders under its hood – but it’s also the first 7 Series that can travel without any cylinders pumping. 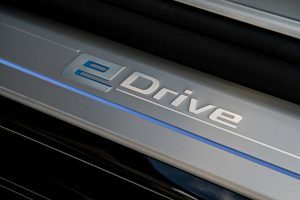 In “eDrive,” the big BMW can motor along on just its electric motor for about 20 miles . . . assuming you remembered to plug in the evening before. This is farther than its main rival – the S550e – can travel before its batteries wilt. The BMW also comes standard with all-wheel-drive, while the Benz hybrid doesn’t even offer it. The Seven also costs several thousand dollars less – even with AWD. Base price is $89,100 – vs, $96,600 for the RWD-only S550e. 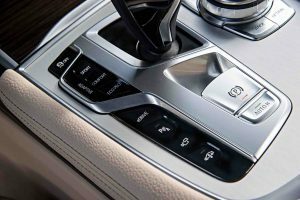 The Mercedes hybrid, interestingly, lists for exactly the same as the non-hybrid (and twin-turbo’d V8) version of the S-Class sedan while the BMW hybrid (as is typical of hybrids) costs more than the non-hybrid version of the Seven: $81,500 for the rear-drive 740i; $84,500 for the 740i with xDrive AWD. 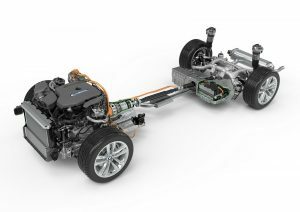 Mercedes has cleverly made the hybrid drivetrain a no-cost option – the thinking being that perhaps more people will sign up, given there’s no cost downside. With the BMW, on the other hand, you have to be willing to pay several thousand dollars extra to drive home the 740e – which will probably encourage more people to buy the 740i. Other possible cross-shops include – or will include – the 2018 Audi A8 hybrid, which makes its debut this spring. There is also the Tesla S.
It starts out lower than all of them at $68,000 for the base trim with rear-wheel-drive ($73,000 with all-wheel-drive) but it is a smaller car that has a much less spacious interior (back seats) and because it’s an electric car, there’s no gas engine to fall back on if the batteries run low. With the BMW – or its two plug-in hybrid rivals – you can operate on electricity or gasoline – or a combination of both. There’s no range anxiety – and you aren’t forced to wait for hours to recharge before you can get going again. The 740e is the first BMW Seven to have less than a six under its hood. But it still has about as much power as a six cylinder Seven – and can go about 20 miles without any of its cylinders running at all. It can be recharged (at home) as well as refueled (at the gas station), too. Goes farther on electric-only than the S-Class hybrid. There’s room under the hood! Standard AWD makes this hybrid snow-day thinkable; the rear-drive-only Benz hybrid isn’t. Not as daunting to manage as the Mercedes, which has so many controls (and so many functions) you sometimes feel like you need a flight engineer to deal with it all. Even at the six figure level, the $7,500 price difference between the AWD-equipped Seven hybrid and the RWD-only Benz hybrid is more than pocket change. Possible Prestige Problem. A four in a Seven may not sit well with the six figure set. Not as strong – or as quick – as the Mercedes. Not as dazzling – on the inside – as the Mercedes. Which has two huge 12.3 inch flatscreen arrays and a cabin bathed in an aura of LED backlit everything. Give BMW credit for committing. The 740e is no half-hearted hybrid, torn between the Need for Speed and the Urge for MPGs. While the big Mercedes still has a fairly big 3.0 liter six as the gas-burning side of its hybrid powertrain, the hybrid Seven has a very small four. Just 2.0 liters and basically the same engine that’s used in the half-its-size Three Series. It makes a modest 255 hp. Modest relative to the size – and weight – of the Seven. Though there are aluminum body panels (trunk lid, hood) and “carbon core” lightweight steel construction, this is still a Seven and so almost 4,800 lbs. at the curb – before anyone gets in. All by itself, a 255 hp four would never be close to enough to move that mass acceptably and no matter how little fuel it used, few people at this price point wouldn’t care, since the car would probably be slower than a Prius and make similarly sad sounds, too. So, add 111 horsepowers’ worth of assist from electric batteries and motors – for a total combined output of 322 hp. Which is more Seven (and 4,800 lbs.) suitable. 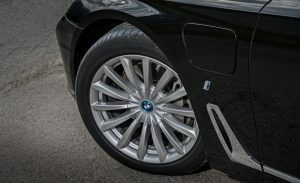 Actually, it’s slightly more power (and torque) than produced by the non-hybrid 740i’s 3 liter six (320 hp) but any performance advantage is cancelled out by the added weight load of the hybrid’s battery pack and DC electric motor – which is mated with the car’s eight-speed automatic transmission. The much lighter 740i (4,191 lbs.) can get to 60 in about 5 seconds flat. The hybrid 740e takes about 5.6 seconds to make the same run. This is fairly middling performance for an almost six figure, top-of-the-line sled. The hybrid S550e Mercedes is much quicker (5 seconds to 60, almost as quick as the twin-turbo V8 version). And it makes sounds more suitable to a six-figure sled. The BMW’s four is . . . a four. It’s a fantastic four. Excellent power-per-liter, strong low and mid-range with a 7,000-plus RPM range on top. But it’s still a four and makes four cylinder sounds in a car that probably needs to have at least a six to be up to snuff in terms of the intangibles. BMW is not run by stupid people. Unfortunately for BMW – and Mercedes and every other car company doing business in Germany and Europe generally – the governments over there are run by stupid people. 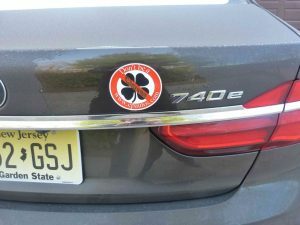 Or at least, by malicious people who hate cars – and who are No Joke determined to kill most of them off by making them onerously expensive. If most people can’t afford to drive, then they won’t. One way this object is being pursued is by the imposition of internal combustion engine No Go Zones. Parts of the country where it is illegal to drive anything other than a “zero emissions” car. Only two kinds of cars qualify: Electric cars and those capable of operating as electric cars for as long as they are within the IC No Go Zone. 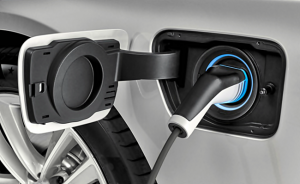 Enter these extended range plug-in hybrids. That’s why they are being built. I averaged just under 30 MPG over the course of a week-long test drive – slightly better than the advertised 27 MPG figure on the window sticker – but about the same overall mileage as I got in a diesel-powered Audi A8 two years ago. But diesels are verboten now – apparently because they work too well. They were delivering hybrid-level efficiency without the hybrid’s cost/complexity. The hybrid Seven’s mileage is about 7-8 MPG better than the non-hybrid 740i xDrive averages. The hybrid Seven also beats the Benz by about 5 MPG overall. 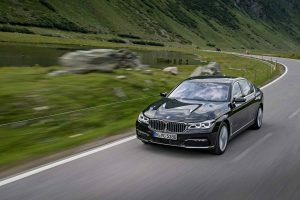 It’s a decent uptick, but then so is the price you pay to buy the hybrid 740e vs. the non-hybrid 740i xDrive. Consider it Uncle’s gift to you. The car’s acceleration is always sufficient but it’s not orgasmic. 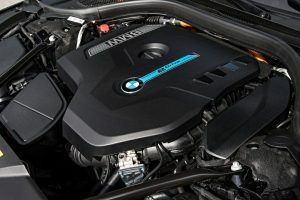 Try the twin-turbo’d V8 750i to experience orgasmic. And for multi-orgasmic, there’s the 6.6 liter V12 – and 601 hp – M760i. It gets to 60 in about four seconds. On the cool side: If you live less than 20 miles from work – and have a place you can plug in when you get there – it is entirely possible you could use next to no gas to get to work and back home again. Impressive. Especially for a full-on (and full-sized) luxury sled. Also, you do not have to gimp along at a Cloverific 40 MPH to maintain electrically-powered forward motion for more than just a handful of miles. You can rock up to 75 MPH without instantly sucking the batteries dry and without producing any emissions – well, at the tailpipe – and using no gas at all. The transitions between gas and electric and in-between are imperceptible. The gas engine is almost dead silent and the electric motor/battery pack totally so. And because the gas engine is often off, things like the air conditioner and even the heater are electrically operated (or boosted, in the case of the heater) and so almost instantaneous. 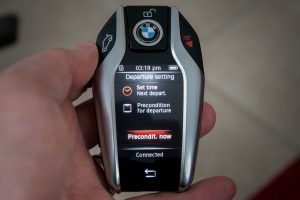 You can even “pre-warm” (or “pre-cool”) the car remotely, via an app or the “smart” key fob that all Sevens now come with. 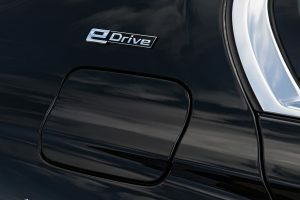 On the not-so-cool-side: The price differential between the hybrid 740e and the non-hybrid (and AWD equipped) 740i xDrive is such that unless gas prices double and you do a lot of driving, the odds of ever reaching break even are slim to none. That goes more so for the S550e (if I’m buying, I’d much rather have the twin-turbo V8). 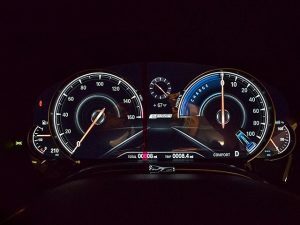 The silent running is neat, though – and so also the configurable LCD array of gauges to monitor everything. These can be toggled (along with the four Drive settings) from economy-themed blue-green to sport-themed red – at which point, a big digitized tachometer replaces the mileage-minded battery charge/discharge meter. The BMW rides on longer wheelbase than the Mercedes S (126.4 vs. 124.6 for the S550e) but it feels less huge somehow, particularly when cornering. Probably this is due to the Seven hybrid being startlingly lighter than the hybrid S-Class: 4,740 lbs. vs. 5,115 for the Benz. And remember: The S550e is rear-wheel-drive. 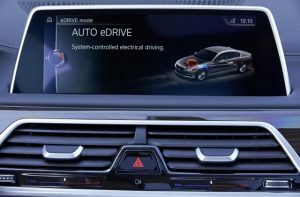 Like the Benz, you can order the BMW with a predictive adaptive suspension – BMW’s is called Active Comfort Drive With Road Preview – that adjusts the ride quality in anticipation of the road ahead as well as how you’re driving the car. Get more aggressive – and the car will feel you and adjust accordingly. 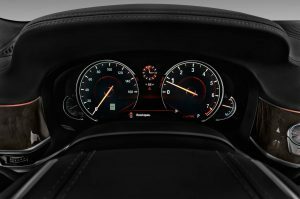 There is also an Active steering assist system, but be aware that unless you use your turn signal before making a lane change, the steering will actually fight you a little bit because it thinks you are “departing” from your proper travel lane. The Seven is an easier car to drive than the S. There is less stuff to manage, the controls not as distracting. A flight engineer isn’t required. Relative to most modern sedans, the Seven (206.6 inches long overall) and its brethren are liners. Park one next to a Camry (190.9 inches) or Accord (192.5 inches) and see what I mean. Then park it next to something like a ’70 Buick Electra 225 or Cadillac Fleetwood Brougham d’Elegance . . . and see again. Do you know whey they called it a “deuce and a quarter”? One end to the other, it was two-hundred-twenty-five inches. That is nearly two feet longer than a Seven – or an S Benz. And almost four feet longer than a new Camry. Today’s Great Whites are nothing compared with yesterday’s Megalodons. Most of the length of the old liners was hood and trunk. The insides were actually comparatively small . . .compared with cars like the Seven. Which has 44.4 inches of back seat legroom (more than the S, which has 43.1) and a whole lot more than the old deuce and a quarter. The back seats in these latter-day liners are actually the best seats in the house – one of the many things that sets them apart from the ordinaries. There is more legroom in the rear – and more amenities, too. 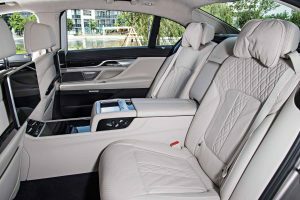 The available Luxury package, for instance, includes power sliding and reclining rear seats, with foot rests and massagers. Deploy the power sunshades (side glass and rear), dial up a movie on the individual DVD flatscreens. 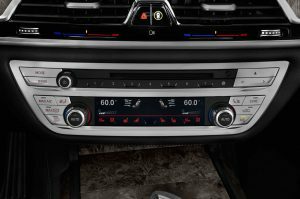 Or twirl your finger (gesture control – yes, really) and crank up the 16 speaker Bower and Wilkens ultra-premium audio system. 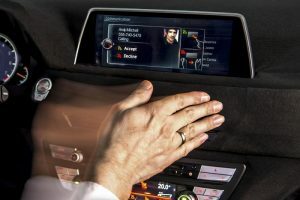 Up front, a scent diffuser and a pair of LCD displays for the driver – though not for watching movies. The floating center stack display is 10.2 inches – smaller than the Benz’s pair of 12.3 inchers. The Mercedes also offers a 24 speaker Burmester super-ultra-premium audio system. Plus a “magic sky” electro-auto-dimming full-length sunroof. Plus leather so creamy it looks poured in. And LED backlighting such that the entire interior glows at night. The Seven is exceptionally nice. But the Mercedes is in another orbit. Which it should be, given its base price is almost $100,000 while you have to toss a few options in the Seven to get that high. The S550e I got to test drive about a month ago was pushing $135k. And looked it and felt every bit of it, too. 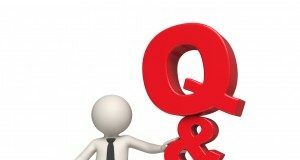 Which has its good and its bad points – depending on what you’re after. The S is almost stupefyingly opulent. It is also more than a little intimidating to drive. Inside, at night, all those screens and LED backlit controls glowing, it feels like the flight deck of a new Airbus A380. But as awesome (right word) as it all looks, you may feel like you need a flight engineer to manage everything while also keeping track of the road. The Seven isn’t like that. It is not intimidating. It does not feel as though it needs a flight engineer to manage the various systems. Everything is pretty straightforward. The center stack display has six main menus and these are accessed by a central push/rotate mouse. The Benz has that plus slide/pinch/swipe and an array of menus and submenus that seem literally endless. It’s a car that’s better to be a passenger in. These six figure hybrids are curious things. Top-of-the-line cars with less engine than many mid-tier cars. Yes, the four in the Seven and the V6 in the Benz are supplemented by the hybrid drive electric motors/batteries. That brings them to par. But wouldn’t you rather have more than par? I’d rather have a V8. Or at least a six. But the political pressures are real and severe and at least the six and V8 versions of the Seven and S are still available, though who knows for how much longer. One last thing: The Seven’s cupholders are an outrage. They will – just barely – take a medium-sized Starbucks cup and that precariously. 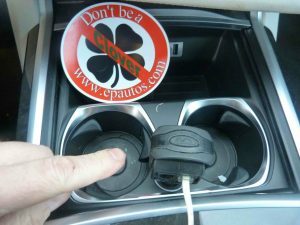 The 12V power point is located in between the cupholders. If you plug something in, it pushes the cups off kilter and makes them even more likely to spill. And there are no other cupholders. Also – the trunk is small for such a large car. 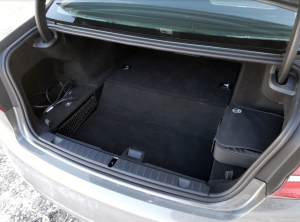 Because about a third of the space you’d otherwise have (18.2 cubic feet in the non-hybrid Seven) is taken up by the batteries. It’s too bad about the diesels. The government indoctrination camps are certainly working, as attested to by the fact that someone who could afford to buy one of these….would actually do so. We must remember that the sole purpose of the 740e Hybrid is to avoid multiple types and levels of government persecution. From a mechanical viewpoint, it is inelegant and unappealing. But it has to evolve this way in order to survive. And things are only going to get worse each year. And: The massaging seats are the bees knees! And there’s the rub. Comparing the performance specs with your article the other day about 1970s muscle car performance, why make a big deal about the 4 cyl power plant when you can sell all the interior goodies? That combination engine/motor will get you moving quickly enough. But who wouldn’t make sure that smartphone-esque key fob wasn’t sitting out at your stool at the country club bar (or the trendy nightclub)? What about the torque? That’s what is needed to get one of this liners up to cruising speed and allows for effortless passing. A high HP is only good on the track and the autobahn where it’s needed to overcome aerodynamic resistance. 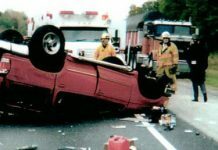 Here in the US with our speed limits topping out at 85 mph, that’s not really a factor. And I totally get this – this is the turduken of automobiles. If I’m wealthy enough to shop for one of these, I’m going for the V12. I’d be happy with the twin turbo V8!